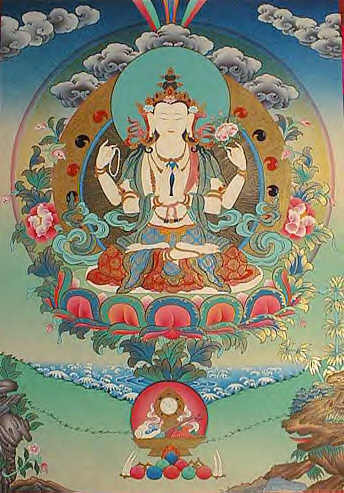 NAMO AVALOKITESVARA MAHAKARUNIKAYA, I VOW TO HASTEN TOWARDS ALL DHARMAS. 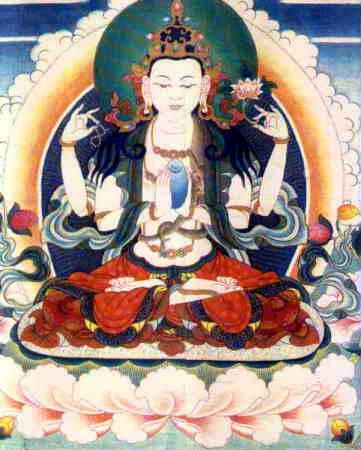 NAMO AVALOKITESVARA MAHAKARUNIKAYA, I VOW TO SOON OBTAIN THE WISDOM-EYE. NAMO AVALOKITESVARA MAHAKARUNIKAYA, I VOW TO HASTEN CROSSING OVER ALL LIVING BEINGS. 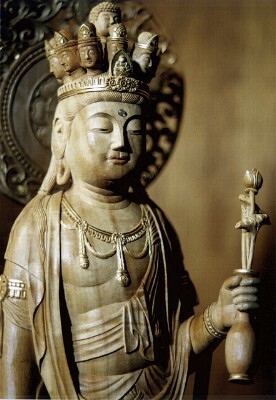 NAMO AVALOKITESVARA MAHAKARUNIKAYA, I VOW TO OBTAIN GOOD SKILL-IN-MEANS SOON. 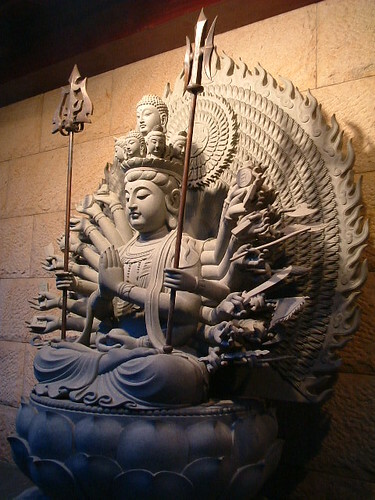 NAMO AVALOKITESVARA MAHAKARUNIKAYA, I VOW TO BOARD THE PRAJNA BOAT SOON. NAMO AVALOKITESVARA MAHAKARUNIKAYA, I VOW TO CROSS OVER THE SEA OF SUFFERING SOON. NAMO AVALOKITESVARA MAHAKARUNIKAYA, I VOW TO ATTAIN PRECEPTS, SAMADHI AND THE WAY SOON. NAMO AVALOKITESVARA MAHAKARUNIKAYA, I VOW TO CLIMB NIRVANA'S SUMMIT SOON. NAMO AVALOKITESVARA MAHAKARUNIKAYA, I VOW TO DWELL IN THE UNCONDITIONED SOON. NAMO AVALOKITESVARA MAHAKARUNIKAYA, I VOW TO UNITE WITH THE DHARMAKAYA SOON. FACING THE SUMMIT OF KNIVES, THE SUMMIT OF KNIVES BREAKS UP. FACING THE BOILING OIL, THE BOILING OIL DRIES UP. FACING THE HELLS, THE HELLS DISAPPEARS. FACING PRETAS, THE PRETAS ARE FETED. FACING ASURAS, THEIR EVIL THOUGHTS ARE SUBDUED. FACING ANIMALS, THEY ATTAIN GREAT WISDOM. Last edited by thornbush on Sat May 16, 2009 9:17 am, edited 2 times in total. Descending resplendently on the Assembly! 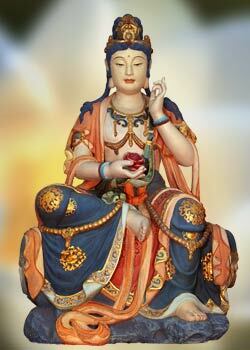 Greatly Merciful and Compassionate, Avalokitesvara Bodhisattva. Navigating in oceanwide sufferings, traversing people across. Last edited by thornbush on Tue Apr 28, 2009 9:12 am, edited 1 time in total. Nowhere is devoid of His Presence. and are equal to both the Buddhas above, and sentient beings below. we generate delusions in the world, and our minds are bound with the cords of craving. Although all phenomena are equal, we conceptualize self and others. Desire and views are the root, and the body is a condition for this. ruining public property, food and drink. but our offences would never be repented. On the point of death, we shall fall into the three lower realms and suffer endlessly. which hinder our cultivation, and obstruct our cultivation. which can swiftly extinguish all such obstacles and offences. Therefore we shall now sincerely recite the Dharani. guard us with Your Thousand Arms and illuminate us with Your Thousand Eyes. May all internal and external hindrances be eliminated. All pledges and practices for the self and others can be completed. We will see our true natures and realize all wisdom. We will conquer all evils and diligently purify the three karmas. 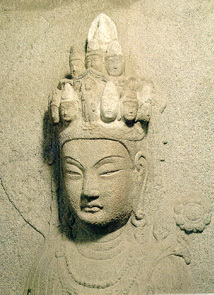 Let us take refuge in Avalokitesvara Bodhisattva and all Great Masters. Aspire to Bodhicitta, and practice the cultivation of mantras. Together with all beings, we admit our many faults and sincerely beg for forgiveness. Our sins will be eliminated. but will certainly be reborn in Amitabha Buddha’s Land of Ultimate Bliss. into the land of wisdom. we shall take refuge and prostrate to the Triple Gem. Arhat: A term used primarily in Theravada Buddhism to signify a person who has fulfilled its ultimate goal, the attainment of nirvana. Upon death, the arhat will become extinguished. The arhat, as an individual, has attained full enlightenment, peace and freedom. Cale, pracale: cala/cale, means move, go; pra, means before, in front. Pra-cali means move on, depart. Cite: from citta; jāla, means web, net. Cite jāla, "web of mind". Citta (Skt., Pali), Mind, according to many schools, the mind in its natural state is intrinscially luminous (citta-prakṛti-prabhāsvara), free from all attachments and conceptualizing, and thus is empty (śūnya) in nature. In early Buddhism and present-day Theravāda, it is regarded as virtually synonymous with vijñāna (consciousness) and manas (intellect) but in later schools of Budddism it is distinguished from those two. It is defined as the cognitive ground underlying the dynamic system of psychological operations (caitta). In this latter sense, some Mahāyāna and tantric authorities understand citta as equivalent to bodhicitta (thought of awakening), and hold that when the natural state of mind is obscured by the false split into a preceiving subject and perceived object, the everyday mind, which is a fragmentation of its nature state, arises. Dhiri dhiri, itī-vāti, vare, ili mili: musical notes for sound effect only. Kusume, kusuma: flower, blossom, garland symbolize purity. Mapanaya: āpana means obtaining, coming to. Mapanaya, apanaya or māpanaye means being lead away, taken away. Oṃ ... svāhā! : In a vedic mantra literally, om (Aham,"I am"), sva-aha (sva "self" -aha "spoken") ie. "Om....svaha" means "I am......self-spoken!". It means much more in Buddhism such as: O Lord, adoration, oneness with the Supreme, merging of the physical being with the spiritual, take refuge in, greeting, so be it, all hail! auspiciously completed, amen. Parama: supreme, highest and final. Sattva: existence, being. "Sat"(true, real, good), "tva"("-ness"). Sattva means realness, goodness, truth and has coming to mean "real being" or "true existence"
Adoration to the Noble Sea of wisdom, the Illuminator, the embellished king, the exalted One, the perfect disciple, the perfectly & completely enlightened being. Adoration to all Exalted beings, perfect disciples, perfectly & completely enlightened beings. Adoration to the noble lord who gaze downward, the enlightened being, the great being, the great compassionate (one). Oṃ! dhara dhara, dhiri dhiri, dhuru dhuru. itī-vāti. Cale cale, pracale pracale, kusume kusuma. Vare ili mili, cite jāla mapanaya, parama śuddha-sattva mahā kāruṇikā svāhā! Like this: I am, hold firm, hold firm, dhiri dhiri, hold on, hold on, itī-vāti, go, go, move on, move on, blossom, blossom. Vare ili mili, mind (citta) web removed, Supreme immaculate being, the great compassionate (one), So be it! "Every person whose heart is moved by love and compassion, who deeply and sincerely acts for the benefit of others without concern for fame, profit, social position, or recognition expresses the activity of Chenrezig." ^Thank you for that. It is quite moving.